Fans of the Sony Reader line, the earliest and at one time best eReaders brought to market in the US, may be somewhat disappointed to head that the current generation of Readers has been cut in its entirety. While they have not been replaced at the Sony online store, all are listed as out of stock and there is a clearance sale going on for the few remaining accessories they have around. Admittedly this most recent Sony eReaders have failed to keep up with more functional competition like the Kindle and Nook, but an abrupt withdrawal from the market like this was unexpected. The last few Sony eReaders have been comparatively basic models for the asking price. The PRS-350, otherwise known as the Reader Pocket Edition, boasted a smaller screen (just 5″), shorter battery life, no wireless functionality, and a price $65 higher than the current least expensive Kindle model. The more impressive Reader, the Daily Edition, actually managed to improve on the Kindle in a few small ways, but still suffered from shorter battery life and a price nearly three times as much as the basic Kindle. Tie this together with an unimpressive associated store and little in the way of media promotion for the eBooks themselves and it isn’t hard to see why popularity has seemed to taper off. Still, in large part due to the ability of the Sony Reader line to participate in library eBook lending thanks to its EPUB support, there have been occasional resurgences in interest in these as valid Kindle competition. What we can look forward to now, hopefully, is a more current and modestly priced Sony Reader. 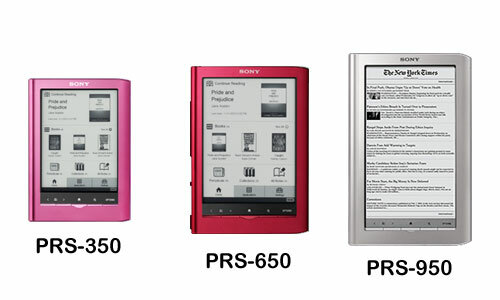 While there has not been any official word on the future of the product lines, unofficial comments from Sony executives have indicated that a new set of eReaders is in the works, with equivalents intended for the old PRS-350 and PRS-650 models. Aside from the fact that they will finally have 802.11n WiFi capability and will continue to have touchscreen interfaces, nothing is known. There is a good chance that we will at least hear announcements by the end of this year. It would be great to see a Sony Reader able to directly compete with Amazon’s Kindle after all these years. Their older models went a long way toward setting expectations for customers new to the field. Sony clearly has at least a pretty good idea how to make a really useful eReading product, so anything that can come in under $150 without sacrificing functionality would gain them some traction. The same would be true of a higher priced option with color E INK. If they can come up with an improved store, or make a deal with an alternate eBook vendor, so much the better. As tight-lipped as the company has been about their plans, we have only speculation, “leaks”, and an FCC filing to go off of for the moment. With luck, they won’t wait too long to get something back in the stores. If you are a Sony fan, you can still find the PRS-350 refurbished in stock at the Sony online store for just $152.99 as of the writing of this article. This entry was posted in E-Book Readers, Kindle Competition and tagged amazon vs sony, kindle vs sony reader, prs-350, prs-650, prs-950, reader daily edition, Sony by matthew. Bookmark the permalink.